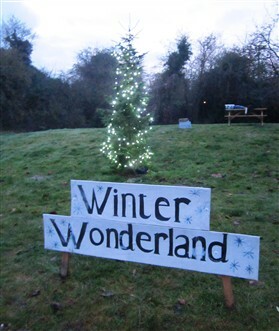 Orwell Show Committee gave the village a wonderful start to its Christmas festivities on Saturday 17th December, creating a magical world in a dark Chapel Orchard with amazing lighting, mulled wine, 'reindeer', and even 'snow'. The lights on the village Christmas tree were switched on and Father Christmas arrived in a magnificent sleigh. Three cheers for the Show Committee ! - especially Sarah and Alexander Reid, Rachel and Wayne Talbot, and many thanks to Alex Parmi for the lights and snow and Set-up Scenery for the sleigh and reindeer. This gallery was added by Sue Miller on 17/12/2016.